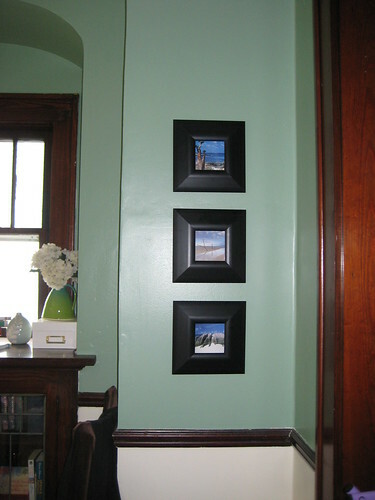 I finally hung some pictures in my house. Only two years late! Story of my life. The downstairs of my house is painted green, and I've been accenting it with blue- blue glass vases, blue pillows (to come), and artwork with touches of blue. I have a large, gorgeous photograph I bought at Penrod several years ago. It's of a bright blue door somewhere in Santorini- I love it, and I can't believe it's been hiding in my closet for two years. It's my first and only true "art" piece so far, and I even tried to find that door in Santorini when I went four years ago. Alas, I couldn't find it. I did, however, take many other "blue" photos in Greece (pretty easy to do; everything there is bright blue!) and I am going to accompany those with some other "art." 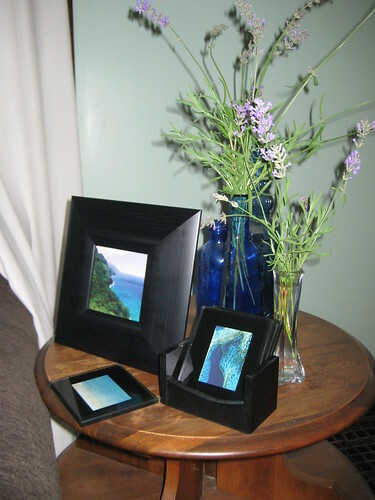 I took some square frames from the clearance section at Target- three bucks apiece last winter. I added some pages taken from a calendar we gave my Mom last year. It's a page-a-day type of beaches from around the world. I picked four of my favorites and hung three on a column in my dining room, and added another to an end table that was missing something in my living room. There are over a hundred photos left, and I didn't want to waste them! 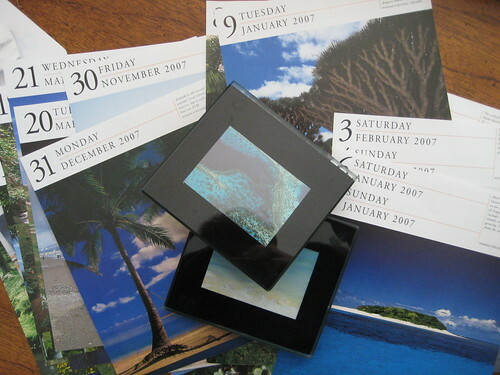 I took some photo coasters that had been sitting empty and unused, and cut up four other calendar pages for those. I didn't want a recognizable "beach scene," so I picked four aerial shots that had texture to them- they are all water, but it's hard to tell when a small section is used in a close-up. Tomorrow I'm going to finish using some of the other calendar pages in more square frames. I love making art out of found pages like this...it's professional photography, but it didn't cost much, and I'm recycling the pages too, in a way.